Happily happy budgie starts aggressive behavior. But noticed it was closed, guess I didn't reply sooner enough! Sorry about that. I am in need of some advice. As of 2 days ago, my lovely jealous happy is being aggressive towards me.. as far as I know, nothing has changed. if I get her out of the cage, she bites me.. if she jumps on my hand, she bites me.. even outside the cage, she bites me. It does appear she wants to be outside of the cage though, as she jumps on the cage as an indication. Even if she gets on the stick of the cage door to get on my hand, she bites me instantly. Oddly enough, if I keep her slightly restrained (eg, a bit upside down) so she can't move much, she still lets me pet her and she seems to enjoy it.. biting stops, for about a minute then starts again. She still flies to my shoulder, and she stops biting me if I feed her millet. Continues though if I stop feeding her. Yesterday afternoon/evening, she stopped biting me though and started again this morning like it did yesterday morning. It's like she's reacting to the budgies I have in my sleeping room and wants to go there badly, thus putting aggressive behavior to me as they do "talk" to one and other often, especially in the morning. Any advice or info of what it might be? How old is Happy now? Is she starting a molt? You should not restrain Happy to pet her. My guess is that she's reached puberty. Many budgies become more independent, aggressive and "bitey" at that stage in their life. As for not "restraining" her, it's not something I often do. Only when she's attacking my wife which sometimes I have to.She really doesn't like to get bit by Happy. If she's becoming less independent like the link you've shown me, any idea why she's still clingy? She often still flies towards me whenever she gets the chance to do so. Randomly she won't bite at all, other times she will. And she's always as jealous as normal. Nice mood swings. Even though she’s not fully mature, she’s a teenager now, and yes, the behavior can start now. They don’t all mature at the same rate. She’s still ‘clingy’ as you say, because it appears she’s fairly tame and she likes you. Some budgies lose this tameness while others don’t . Guess the fondness of me didn't really stop. Though apparently she only likes me and me alone.. weird. Besides the age issue there can be any number of reasons for aggressive behavior. Territory, possession, frustration are all things that can cause a bird to be overly aggressive. You can also have learned aggression which is when the bird has learned that being aggressive gets it what it wants. For instance, if the bird bites when you put your hand in the cage and you withdraw your hand and this is done repeatedly the bird may associate biting with getting what it wants which in this case is to get your hand out of its cage. What is the reason that you have her separated from the budgies in your sleeping room, this may be causing her some distress. If a bird is very bonded to you and possessive it may see another person as a threat to the relationship and be aggressive towards that person. I often let me hand stay where it is when the budgie is biting, though at times I have to put her back or move her on my hand a bit because she tends to bite at soft skin as well which actually hurts a lot. I know that if I move her back often whenever she starts biting she can learn from it ^_^. The reason why I keep them separated is because I have 3 budgies in total. 2 Females, 1 male. 1 male and female are already together since the beginning and I have another female which I read they will no go in pairs, especially if there's another male involved. So I decided to keep the 2 together, and keep Happy in a single cage seeing she's been very bonded to me since the very beginning. As you said, that's the reason she starts to attack anything and anyone I come in contact with. I'm home often, so I have time enough to give her attention. Now here's the weird part though. As of 2 days ago I swapped the budgies cages so Happy would be in my sleeping room. And in 2 days she's been in there, she stopped biting me. She kept flying to my should whenever she had the chance, was able to play with her constantly and even flew to me whenever I wanted to leave the room when she was free (I'd assume this would be a 'please don't go') and was friendly and pet-able as she used to be. Her behavior completely changed. Once I moved her cage back again today, the biting started again almost instantly. She still flies to me though, either to my finger/hand or my shoulder. But that comes with a lovely bite bite. Did something change? Nope, the living room always had the same person (my wife) as it always had. So I can't really seem to figure out as to why. Even if my wife isn't home she still bites me. Now I get this could be age related. 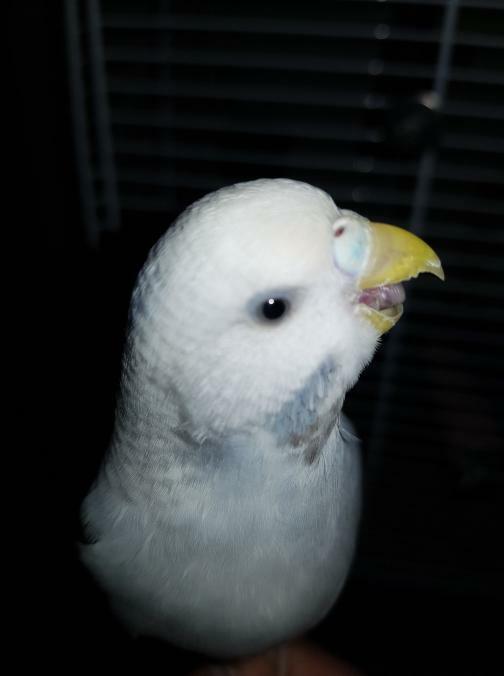 But why did the biting completely stop and started to become the friendly budgie that I knew once I swapped the cages? Last edited by Skyrider; 02-15-2019 at 04:51 AM. When a budgie is hormonal, the change of location of the cage, the items in the cage or moving into a new cage can help calm things down. Perhaps that is why she went from being aggressive back to friendly when you moved her. I think Happy has sent you a clear message as to what she prefers so if it works for you I would go with it. So often they do end up training us.